As a bulky quilt-style bag, the Dorado HD was comfortable, its extra space makes for a pleasant mild-weather sleeping environment. With more than enough room for one person, it is a perfect bag to double up and use for two and is better suited for car-camping than backpacking. But without headspace users’ heads are directly on the sleeping pad. Because no compression sack (or stuff sack) is included with the Dorado HD, I used a Sea to Summit eVent dry compression sack for comparison purposes. The bag compresses with a little more than average effort; however, it does still manage to get down to the size of a medium watermelon. Since this is a bag more suitable for car camping, that may be less of an issue. Even with the waist drawstring, the bag was just too large and drafty for temperatures less than the low 50s despite its 35-45F rating. In those higher temperatures, the bag was perfectly comfortable, and I enjoyed the versatility of the quilt-style. For its bulky frame, the Dorado HD was more comfortable than anticipated and the down fill does make for a light, comfortable quilt. I still prefer a traditional mummy style but the Dorado was a nice change and it would be a fantastic car camping choice. The Dorado HD showed no signs of wear and tear during the testing phase. The zipper did snag a few times and, although I was careful to un-snag it, I expect it could result in some tearing or fraying at some point with continued use. Therm-a-rest uses a 20D polyester taffeta for the lining and a 20D ripstop polyester for its shell. The Dorado HD features sewn-through baffles, Nikwax Hydrophobic down and a cinch-able top and waist area. The waist cinch only slightly helped taper the bag. The full, universal #8 YKK zipper makes it easy to mate with another bag and also lay completely flat over two people, transforming it from sleeping bag to quilt. 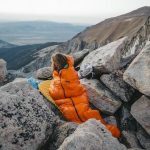 Like all Therm-a-Rest sleeping bags, the Dorado HD is compatible with Therm-a-Rest’s sleep system so that a user may attach the SynergyLinkconnectors to be secured to a large 25 x 77 inch mattress. Users who choose to use these connectors must move within the bag rather than the bag moving with the user, since the bag is attached to the pad. Attaching the bag to the pad is of course optional.